Very informative. Should NJ have a bill that forbids breeding of “pit bulls” by unlicensed people? On many info boards at food markets, especially inner city markets, you see “for sale pit bull puppies $xxxxxx” Such a law might reduce the number of abandoned pit bulls, put penalties would have to be severe and licensing fee high. Not sure exactly how many pit bulls are “put down” in NJ each year, but many shelters have an overly high population of this breed. Thank you for the kind words. While a pit bull breeding ban or mandatory spay/neuter for pit bulls sounds good in theory, the result would not be good in practice. These types of laws result in more pit bulls getting impounded and eventually killed. Additionally, scarce financial resources are diverted from sheltering and finding dogs homes to enforcing these laws. Also, heavy handed enforcement of these laws typically hurts the relationship between the shelter and its community. Given community relations are integral for a successful shelter, this is a pretty big deal IMHO. Below are some blogs on mandatory spay/neuter laws from the president of KC Pet Project (Kansas City’s no kill open admission shelter). He discusses how enforcing mandatory spay/neuter laws for pit bulls has resulted in more pit bulls coming into their shelter. I believe pit bull breeding bans would have a similar result. In this blog, he discusses research on why pit bulls end up in shelters. While backyard breeders do exist, the primary reason is landlord policies and poverty. 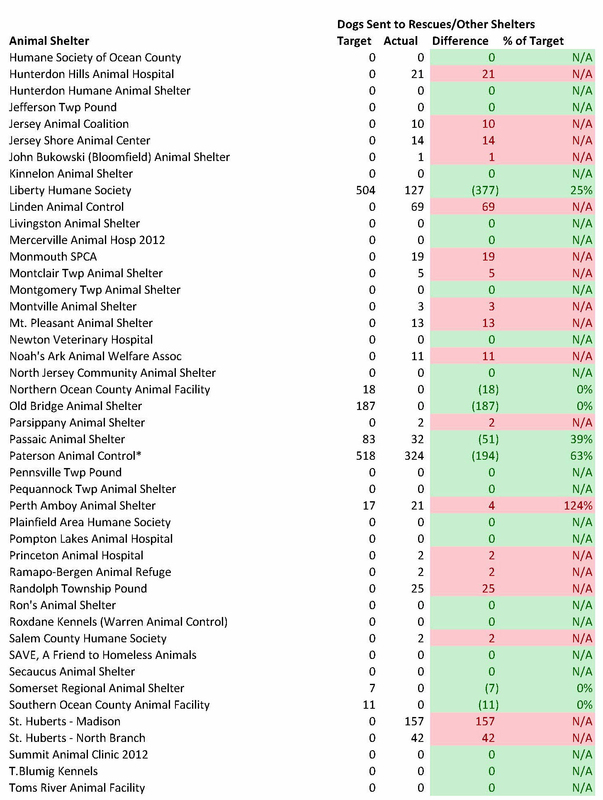 Overall, my analysis (based on a peer reviewed study detailing how long pit bulls take to get adopted), finds most New Jersey shelters have enough space to place their pit bulls and rescue a lot of others. Some shelters, such as Liberty Humane Society and several other urban facilities, are space constrained and do need help. However, this is due more to inadequately sized facilities than too many dogs coming in. However, other New Jersey shelters with excess capacity should be able to pull these dogs and many more from elsewhere. Generally speaking, the large numbers of pit bulls at most New Jersey facilities is due to shelters not adopting them out as quickly as they should. For example a shelter with pit bulls comprising 50% of dog intake, will have pit bulls making up 80% of the shelter population if those pit bulls take 4 times as long to leave the shelter. Thus, this is a great way to reduce pit bulls from coming into shelters. Also microchip events can help increase the number of lost pit bulls get back to owners. Salt Lake City does a great job with this. 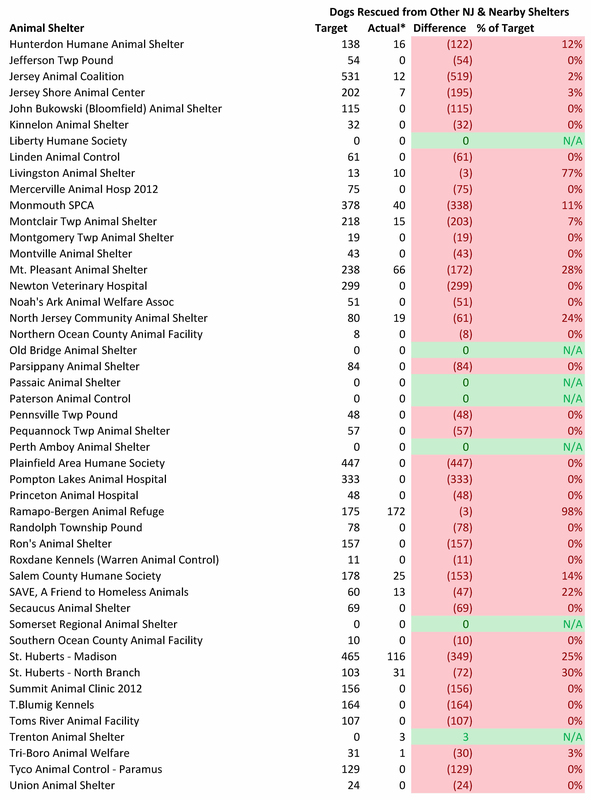 Here are some open admission shelters (most take in as many or more pit bulls than NJ shelters) who have basically achieved no kill for their pit bulls. I’d like to know where the information came from (direct statistics) as well as knowing WTH your’re smoking saying “New Jersey Animal Shelters Contain Enough Space to Save All of New Jersey’s Dogs and Many More from Other States”. CCAS fights DAILY to keep enough open kennel space (as I know CCSPCA does). For you to blatantly say we should not only have open kennels, but enough to take in from Philly & NY which are MAJOR METROPOLITAN CITIES with euthanasia’s in the thousands – is just ludicrous !!!! All the details on how I performed the analysis are described in the blog. 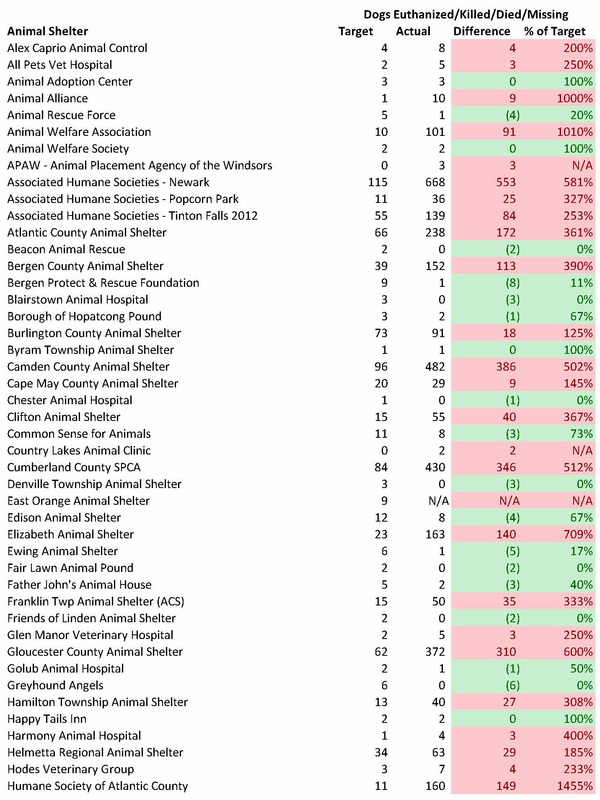 Specifically, the actual numbers came from Cumberland County SPCA’s 2013 “Shelter/Pound Annual Report” submitted to the NJ Department of Health by Bev Greco on May 30, 2014. Certain adjustments to these numbers are described in each section of the blog or at the bottom of the tables. The target numbers were computed based on the methodology described in the Appendix section of the blog. 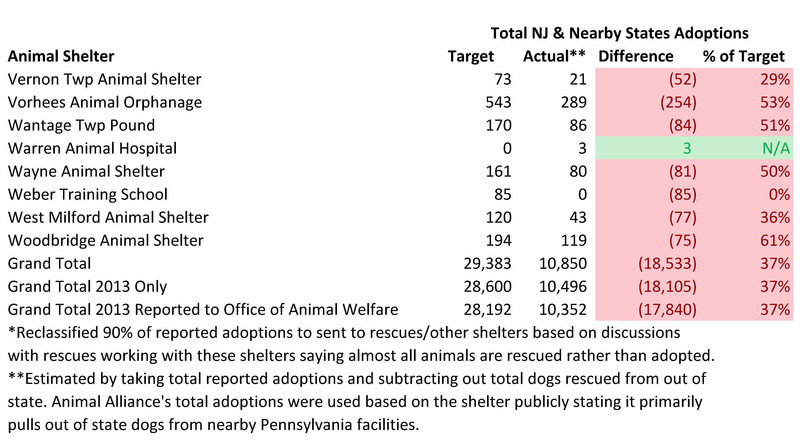 Please note the adoption targets were based off two no kill animal control shelters performance in New York (documented in a peer reviewed scientific study). The targets take into account unadoptable dogs (5% of intake based off the experience from numerous high performing animal control shelters), pit bull intake, and higher and lower intake months. Thus, the estimated time to get dogs out before the shelter runs out of space is reduced for things like estimated pit bull intake and more dogs coming in the summer. As for you comments about these targets being unrealistic, you are wrong. 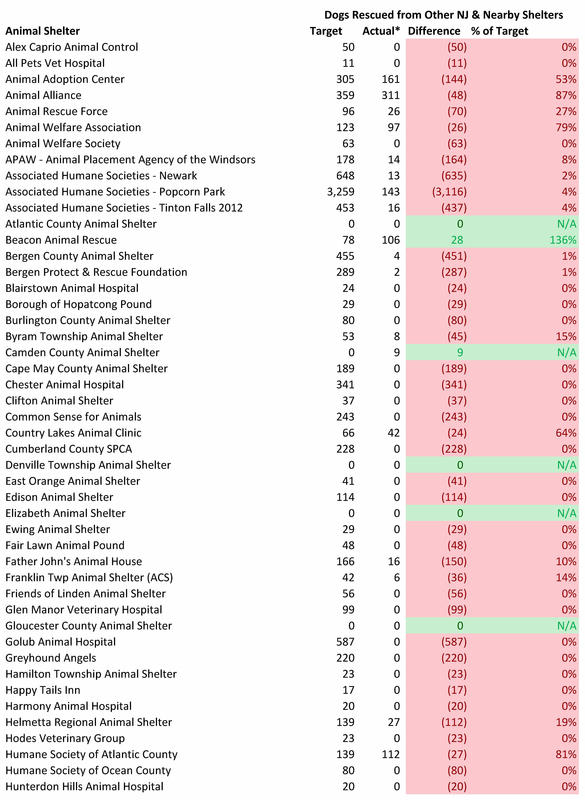 Numerous animal control shelters are adopting out nearly 3 times as many dogs per capita as I target for New Jersey shelters statewide (individual shelters with somewhat higher intake should be able to adopt animals in various parts of the state due to New Jersey’s small size). Additionally, some shelters are adopting as many if not more pit bulls than I project and that is with 2/3 more dogs to compete with in their adoption markets. Something cannot be impossible if it easier to achieve than what already has been. Right off the bat, I can see from a quick view of Cumberland County SPCA’s web site that your shelter clings to outdated policies refuted by empirical data. Specifically, the shelter argues against free adoptions, and does not use a conversational based adoption process (i.e. 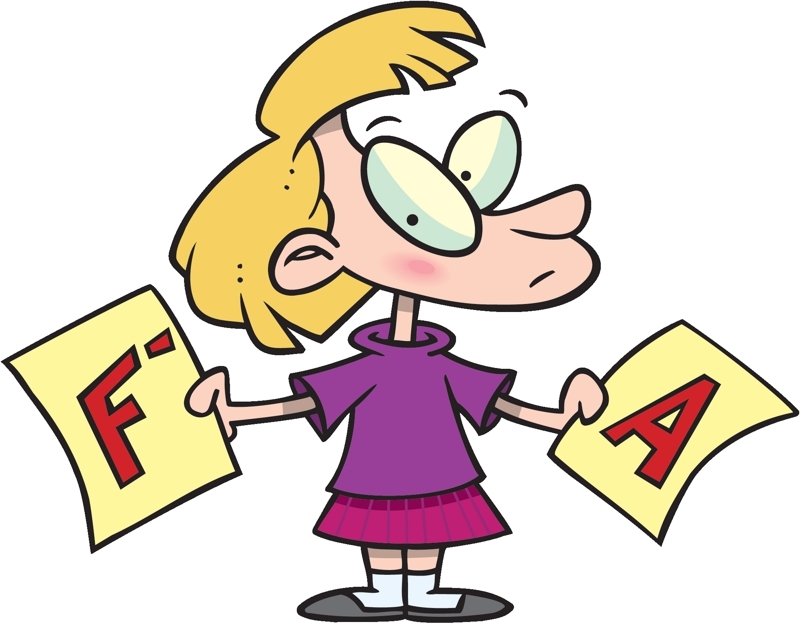 has many black and white rules that don’t result in higher quality adoptions). I suggest you watch the following video with shelter experts from HSUS, ASPCA and Petsmart Charities on adoption policies than will increase adoptions and make better matches. The problem with NJ’s high rate of shelter killings has to do with the enormous amount of Pit Bulls. Rottweilers and other bully or molosser breeds in our shelters. The shelters with the highest kill rates–Newark, Camden, Trenton, Paterson, are all areas with lots of poverty and crime. There’s rarely anything but Pits and like dogs in their shelters. Not only that, but many of those dogs have been abused, mistreated, and not only trained to fight but BRED to. Many can be sweet and good but selective breeding can create very dangerous animals. You can’t expect your average adopter to want a bully breed from the inner city, because your average person is still afraid of dogs like that. Along with that, you have to be wary of people who might want those dogs as vicious lawn ornaments or to put them back in an abusive situation. Even if you can find a nice family who is opened to a Pit or other strong breed, can they train him well? Will they make sure they’re the alpha and the dog doesn’t run the house? Will they be able to teach others how to act around their dog? The sad fact is that the only way a lot of shelters can get lots of dogs adopted, is to import dogs of various breeds, ages, sizes and coat types. It’s not helping anyone if a shelter waits a year for one Pit Bull or Rottweiler to get adopted when in that time they could have adopted out a a Beagle, two mutts and a Shih Tzu in his place, who would be otherwise put down in a shelter in Alabama. These ratings also make otherwise good shelters look a hell of a lot worse. 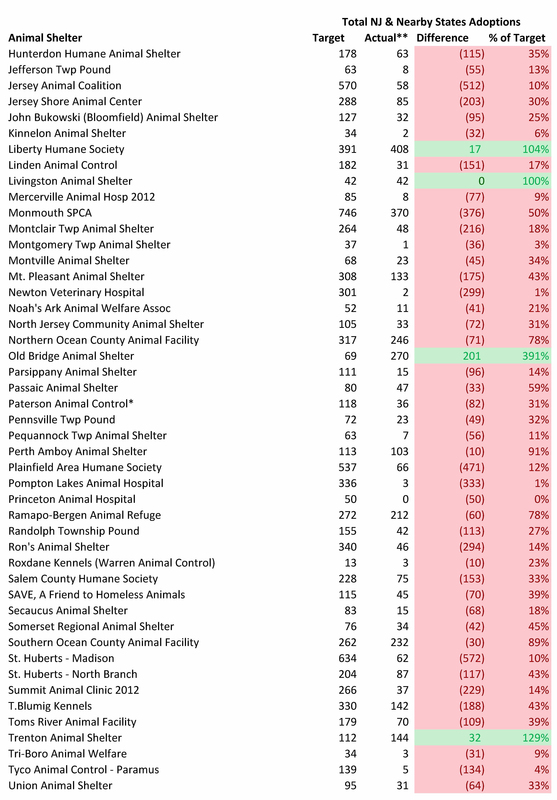 The shelter I’ve volunteered at for 13 years and where my family and friends have adopted a total of 5 pets from, is in the red a lot. They adopted out 1006 animals this year. 1006! But because they put down 8 dogs they’re in the red for being “200%” over their kill target? Give me a break. They only ever put down animals if they are near death (and up to ten grand or more has been dropped on individual animals with health issues) or so dangerous they would kill you. There are always 1-3 adult Pits or pit mixes in the shelter that are typically pulled from Newark or other crappy areas. But they often take FOREVER to get adopted. One sweet, well-trained, but scary looking Pit stayed in the shelter for 3 YEARS before he was finally adopted. Can you imagine the small number of dogs the shelter would adopt out if they filled up with bully breeds? Not to mention the potential adopters who would be so turned off by the overflow of bully breeds that they would end up running to puppy stores or breeders. A rescued dog, is a rescued dog. And if one Pit Bull had to be put down so my mixed breed and her 5 siblings from NC could be rescued, well then that animal didn’t die in vain. If you want the NJ shelter killings to go down, offer free spay/neuters to Pit Bulls in the inner cities. On a final note, you do realize a shelter can be called “No Kill” as long as they put down less than 10% of the animals they receive right? Total no kill is impossible because some animals arrive so ill/injured, elderly or dangerous that they must be put down to avoid their suffering and to protect the public. A lot of the inner city shelters are doing a really bad job, but plenty of the shelters there are doing very well, but you made them look awful. No kill is more than just meeting a certain euthanasia rate – it is about not killing healthy and treatable animals (i.e. returns euthanasia to its dictionary definition). 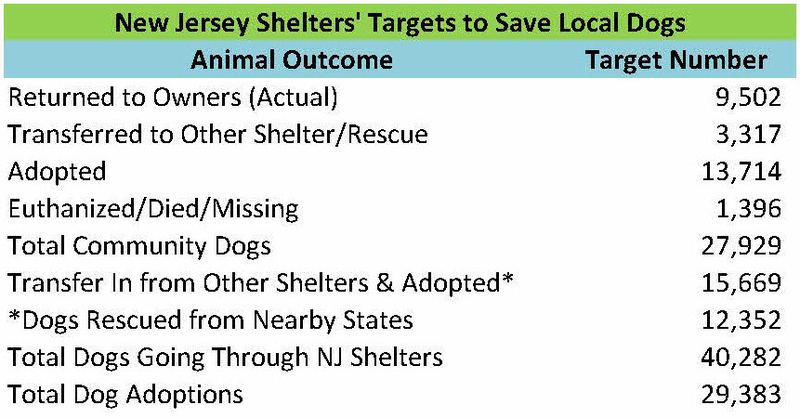 10% has been used as a guideline for animal control shelters (IMHO 5% is more appropriate for dogs coming into New Jersey shelters with few vulnerable stray puppies coming in), but it doesn’t automatically make you no kill. For selective admission shelters, it is quite easy to only euthanize 10% and the number does not mean much. That is why I target lower numbers of euthanasia for rescue oriented verses animal control shelters. Urban shelters are killing many dogs because of poor policies and/or rescue oriented shelters failing to do their part in helping them out. These urban facilities were designed to catch and kill dogs and therefore do not have enough space to keep most dogs around long enough. Thus, these shelters don’t have enough time to find dogs homes before they run out of space. Some rescue oriented shelters simply refuse to do the hard work to help these space constrained facilities out and the deadly results speak for themselves. 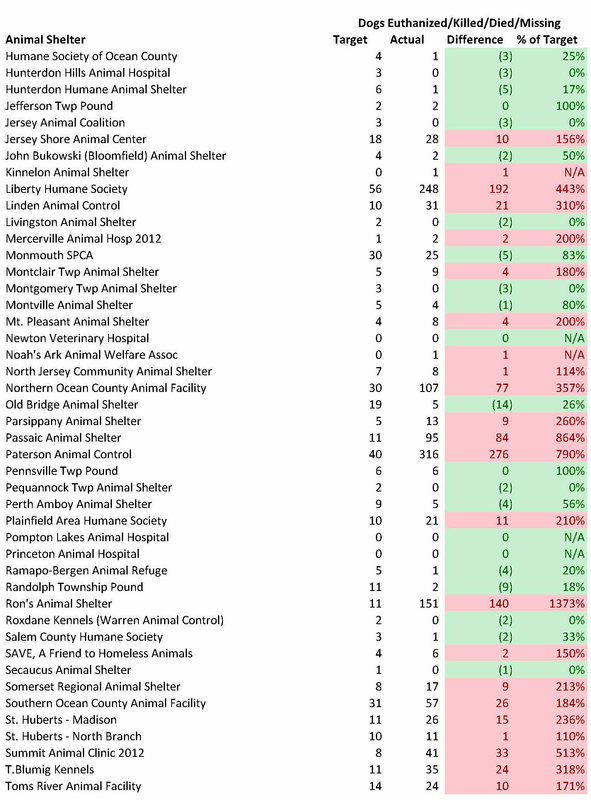 New Jersey’s urban shelters do not get an exorbitant amount of the breeds you mentioned. First, not that many Rottweilers come into urban shelters. As for bully breeds, our urban shelters take in far fewer pit bull type dogs than many no kill animal control shelters across the nation. 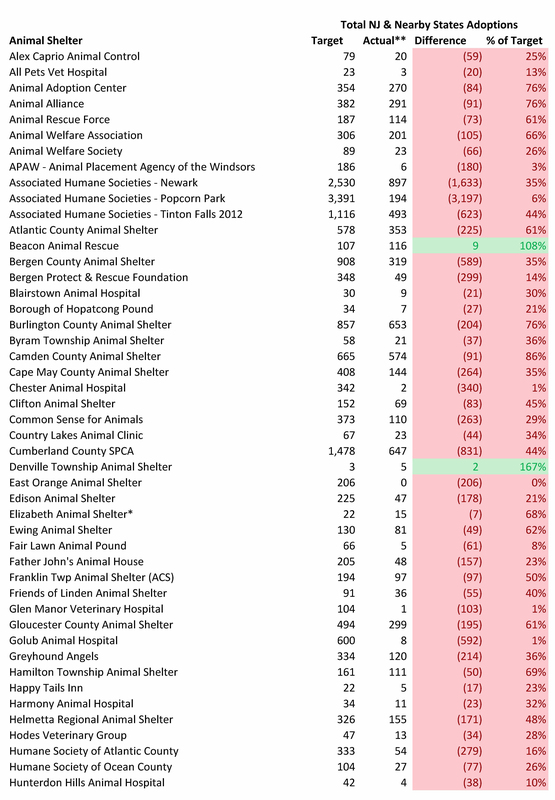 Specifically, New Jersey shelters take in around 1.15 pit bulls per 1,000 residents based on my estimates. Longmont Humane Society saves 95% of its pit bulls and they take in about 3.59 pit bulls per 1,000 people. KC Pet Project takes in around 3.4 pit bulls per 1,000 people and they save around 90% of them. Salt Lake City Animal Services takes in about 1.4 pit bulls per 1,000 people and it saves 91% of them. Even an urban shelter, such as Associated Humane Societies – Newark takes in far fewer pit bull per capita than Longmont Humane Society and KC Pet Project (estimated 2.06 pit bulls per 1,000 people assuming 50% of their dogs are pit bulls). 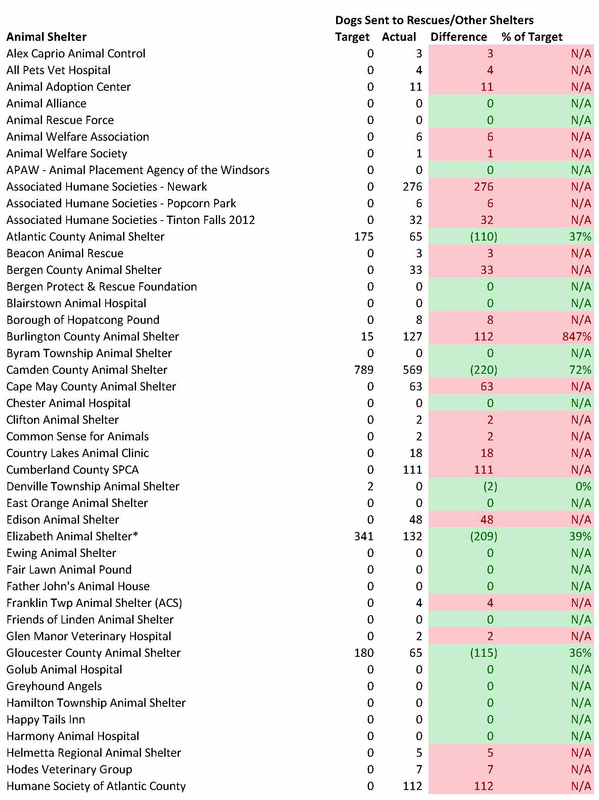 Thus, New Jersey shelters actually take very few pit bulls in compared to these no kill animal control shelters. Your assertion than no one wants these pit bulls is also false. All these shelters adopt out as many if not more pit bulls per capita than what New Jersey has to do as whole. Specifically, Longmont Humane Society is estimated to adopt out 2.14 pit bulls per capita compared to the 0.70 figure for NJ shelters need to save 95% of their dogs and the 1.81 pit bulls per 1,000 people NJ shelters should adopt out (i.e. counting rescued pit bulls from nearby states). KC Pet Project most likely adopted somewhere around 2 pit bulls per 1,000 people this year which also exceeded my targeted numbers for NJ shelters. Salt Lake City Animal Services likely came close to my adoption targets for NJ to save its pit bulls. The cities saving their pit bulls also have high poverty rates. Certainly Kansas City and Salt Lake Animal Services have high levels of poverty, which are reflected in their high per capita pit bull intake. Other cities with very high poverty rates are approaching no kill level save rates. Examples include Washington DC, Richmond, Virginia, Arlington, Texas, and Atlanta, Georgia. Thus, the claim no one wants pit bulls from poor urban areas is wrong. Additionally, Perth Amboy Animal Shelter, which is in a city with a high poverty rate, euthanized fewer dogs than I targeted for them. Almost certainly, they saved over 90% of their pit bulls based on their high overall dog live release rate of 97% and pit bulls making up a substantial portion of the dogs they take in. Furthermore, Liberty Humane Society, which served Jersey City and Hoboken during this period, exceeded the adoption target I laid out. Thus, even shelters in poor urban areas of New Jersey can achieve the targets I laid out. And pit bulls should not take a long time to get adopted. A peer reviewed scientific study conducted at two no kill animal control shelters in New York found pit bulls over and under 1 year old only took 49.3 and 27.5 days to get adopted. This is the standard I used for New Jersey shelters for their estimated number of pit bulls. Longmont Humane Society and Salt Lake Animal Services pit bulls take around this time to get adopted Other shelters, such as Greenhill Humane Society in Oregon and KC Pet Project, pit bulls only take around 40 and 19 (estimated) days to get adopted. Thus, your notion pit bulls take “forever” to get adopted is patently false. Also, nearly half the dogs at Longmont Humane Society and KC Pet Project are pit bulls. Yet, both shelters quickly adopt them out contrary to your declaration. Thus, shelters filled with pit bulls adopt them out quickly. You can read more about how these shelters do it in the following links. The under-performing shelters are not doing most of these things. How else do I know almost all of these dogs are adoptable and wanted? I’ve worked with hundreds of the very pit bull type dogs you describe. Furthermore, nearly every one of the adults I fostered were adopted out within a month and that was without the advantage of having a shelter open to the public. 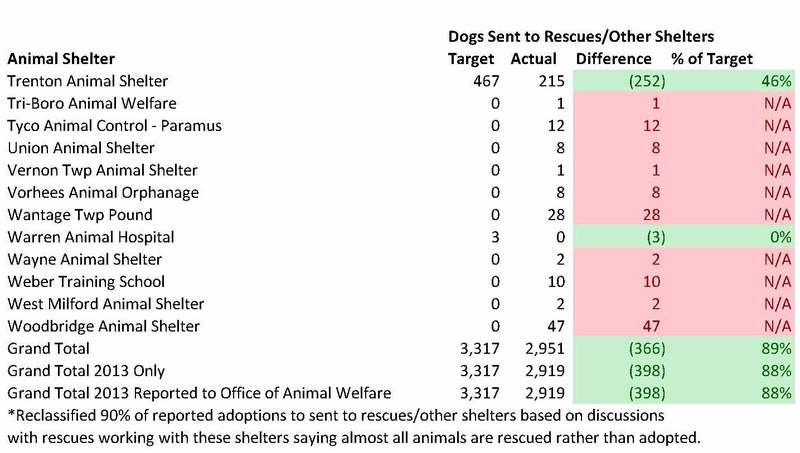 The number of dogs the shelters should adopt out if they performed as they should (based on conservative targets) is laid out in the blog. Thus, I don’t need to imagine the number. Finally, your attitude about pit bulls “selective breeding” and many being “abused” and “dangerous” hampers their adoption prospects. If your shelter has this attitude, no wonder pit bulls take “forever” to get adopted. First, most pit bulls aren’t even pure pit bulls and most shelters label dogs as pit bulls when they aren’t even pit bulls. In fact, Animal Farm Foundation, which is the group shelter experts defer to on pit bulls, recommend shelters treat pit bulls as any other dog. The language and labels you are using (abused, dangerous, etc) certainly has a negative effect for these dogs. I suggest you educate yourself about these dogs and how to properly market them. I’ve only skimmed this, but I like really appreciate any analysis of the real data. I’m currently working on this. Stay tuned!